Yes, that's right. We're in Ironforge now. At this point you should have essentially completed Dustwallow Marsh, done a bit of Stranglethorn, and we're hitting up a third zone before wrapping up Stranglethorn. Go to the Explorer's Hall and grab the quests Ironband Wants You! and Reclaimed Treasures. You can leave the rest. Be sure to get the letter for Martek the Exiled out of the bank. If you're feeling particularly rich, buy the following items from the auction house, but don't forget that you'll be hoping to buy a mount at or after level 40 that costs 90 gold. These are for a few additional quests you can complete if you feel like dropping the cash. I am not recommending that you do so, but it is certainly an option. Fly to Thelsamar and set your hearthstone there. Before leaving Thelsamar, talk to the alchemy trainer for the quest Badlands Reagent Run. Then head across the zone to the southeast corner and Ironband's Excavation. Ironband himself will give you a quest to locate one of his lost men, Agmond. 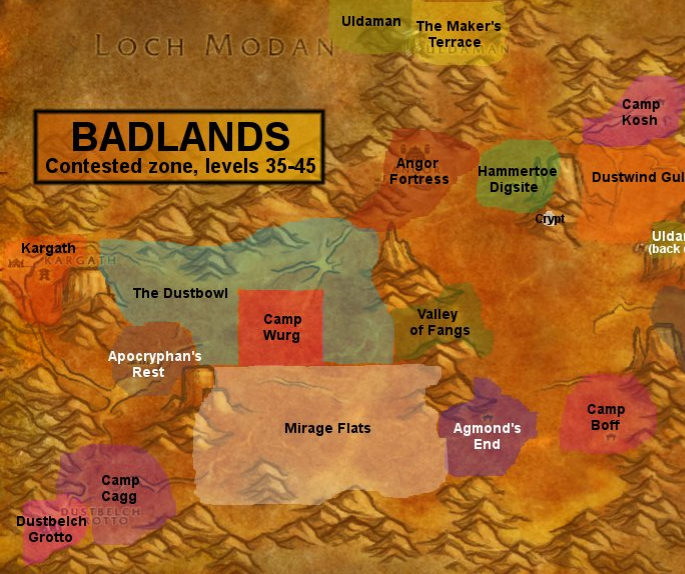 Now you're ready to go into Badlands, which is at the south-central edge of Loch Modan. March right past the entrance to Uldaman and you should see a Dark Iron Dwarf digsite in front of you. Go around it to the right and climb the back of the hill it's on, where you will find two dwarves. You should be able to pick up two quests from here. Now you're actually ready to get started. Go back north to Hammertoe's Digsite. By the back wall of the digsite are a few tents, one of which has a map on the ground that you can grab for another quest. Take it as you hack your way through the dwarves, looking for Ryedol's Lucky Pick. After you have it, leave to the northeast and head for Camp Kosh. There's nothing complicated about Camp Kosh. Go in, kill ogres, find the crate you can loot, and move on. Once you have it, return to the two dwarves. You can either go back the way you came, or around the other side of their hill. You can go right into scene 2 from here. From the two dwarves, go southwest into the Valley of Fangs. It's a narrow pass between the two large rock walls that cut the zone in half. You will find Martek the Exiled here, as well as another quest giver, and most importantly a merchant! Sell off all your junk except for Buzzard Wings. Head northwest to a small camp along the north wall where two gnomes are studying rocks. They'll give you a quest to kill the lesser rock elementals on the slopes above them. This might take a little while, but you need to kill stone elementals for the reagent run anyway, so take your time. Hopefully you'll have the place to yourself since the place is kinda tight for multiple players. Go south into Camp Wurg to kill a couple ogres before returning to the vendor in the Valley of Fangs in the east. Leave the Valley of Fangs to the east and follow the near wall south. You should eventually find a battered dwarf skeleton. Alas, poor Agmond. You should be feeling bitter and angry at the murderers of poor, defenseless Agmond. Take it out on the troggs to your south. You need to kill 12 bonesnappers and Murdaloc for the next quest, but you also have a quest to collect Indurium Flakes from these guys, so take your time. The drop rate on Indurium is horrid. Somewhere in your trogg-slaying, leave the site to the south and a little west to find Theldurin the Lost. Take his quest and get back to business. Once you finish Murdaloc, you can leave without finishing Indurium. Tear yourself away and go east to Camp Boff. Kill Coyotes and Buzzards along the way if you haven't finished Reagent Run yet. Clean out the camp and then go north. After you pass the High Elf Garek and a pass to the east, there will be more troggs in the ridges above you. This is the back entrance to Uldaman, and although you won't be entering, the troggs here are a little easier to kill if you still need to finish Indurium. Clear out the camp, and then go back to Camp Kosh to clear that out for Scrounging. Bounce back and forth between the two until you finish them. Quests completed: A Sign of Hope, Power Stones, Agmond's Fate, Solution to Doom, Uldaman Reagent Run, Reclaimed Treasures, Prospect of Faith 1 and 2, Passing Word of a Threat 1 and 2, To Ironforge for Yagyin's Digest, The Shattered Necklace. Uldaman is the area you passed on the way into the zone in the very beginning. It consists of a very large digsite that eventually leads into some old Earthen ruins in the form of an instance. The instance portal is very far inside. The area outside Uldaman used to all be elite. As a result, the demoted mobs are not nearly as hard as they once were. It's possible to solo the area, in spite of the droves of adds you will get at some point, at level 40+. Still, once inside, there are tons of mobs, so don't get reckless. However, you have no less than SIX quests to finish in Uldaman. Stranglethorn can wait one more level. Approach Uldaman, kill a few surveyors as you work your way toward the tunnel mouth, and go inside. Don't avoid any fights. Not only do the mobs tend to add when your current target runs, but you need all the kills you can get for Power Stones. Two other things you need to watch out for are small urns and large pink mushrooms for Agmond's Fate and Uldaman Reagent Run, respectively. As you progress down into Dig One, you will pass one hall to the right, and then enter a small chamber with two exits. The one further to the right has troggs lining the hall and the hall up an incline in the back heads to some other chambers and has dwarves all over. Clear the two dwarves on the floor here, and then pull the two on the ledge when there is nobody approaching from the hall. You will get overwhelmed if you don't kill these four first. Wait there for Magregan Deepshadow to make his appearance. Pull him and kill him to get Hammertoe's amulet. Head into the tunnel he came from and go into the chamber on the right. In the center of the room is a large coffin / Ark-of-the-Covenant sort of thing. Clear down the left side of the room (this will include a 3-pull) and kill the two guys by the ark so you can get the Tablet of Ryun'eh from inside. Turn around and go back out to the hallway where you saw the troggs. This will be the most annoying area, primarily because some of the troggs are ranged and like to net you and then move away. This means you need to bring your pulls back into the hallway, or you will end up like my poor hunter and literally end up fighting five at once. (I won that fight, somehow, but beast masters are OP for leveling.) The tunnel leads into a true hallway that turns to the left and into a large half-finished room. Stay down the left edge of the room and you will find Krom Stoutarm's treasure along the back wall. At this point, you need to just fight back out and make sure you've collected your urns, mushrooms and power stones along the way. Talk to Hammertoe Grez on the way out, and then return topside. You can still get power stones from the mobs outside, but you'll need to have all the other quests finished first. Hit up the two dwarves, the goblin in the Valley of Fangs, and Theldurin all the way to the south before hearthing or running back to Loch Modan for two more quests. Fly back to Ironforge for the last couple quest turn-ins. Complete what you can in IF, and drop anything that requires you to leave it. The Shattered Necklace, which you no doubt picked up at some point, goes to Talvash del Kissel in the Sacred Ward. You should be level 40+ at this point. This means three important things. First, level 40 is arguably about the halfway point in the leveling process. Well, not quite. It slows down as you move forward, as you've already noticed. But the rules of the game change a little. Second, you should be able to train the last of your class abilities until level 62 (except for 41-point talents.) This means you are getting some rather noteworthy skills, such as a new armor type for four of the classes. Be sure to hit your trainer for *important* skills. Third, this used to be when you could acquire a mount. (It has, as you are no doubt aware, been adjusted to 30.) The direct consequence of this is that zones in the forties are much bigger and more expansive. There is a trend among these levels to have lots of big, wide open, featureless areas. Travelling becomes routine, both for flight and for ground travel. We're going back to Stranglethorn next, which certainly could use a mount, but the zones that come after that will certainly make you glad you have your mount. Regardless, because we are going back to Stranglethorn, there is one thing we've had sitting in our log that you'd better take care of before returning. You've got a bag of water elemental bracers that some lucky mage in Dalaran is eagerly awaiting the chance to inspect. Fly to Southshore and talk to Archmage Ansirem Runeweaver on the outskirts of the ruined mage city. Then hearth/fly/somehow else return to Booty Bay for Act 10. This page last modified 2008-12-19 20:32:30.